Part two of my continuing education of the influential Western director Budd Boetticher is his second collaboration with Randolph Scott, “Decision at Sundown”. After watching only two films (first being “The Tall T”) Boetticher’s inate talent with story and character is apparent. Boetticher distills his films down to its essential elements of conflict, character, theme and plot. But within this minimalism the characterizations of hero, villain, and the damsel in distress are as complex as any genre picture. 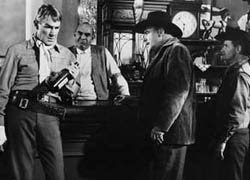 Randolph Scott plays Bart Allison, who with his friend Sam (Noah Berry), arrive at a typical western town called Sundown to break-up the wedding of Tate Kimbrough (John Carrol) and Lucy Summerton (Karen Steele). Bart is aiming to avenge the death of his wife and kill Tate, whom he accuses of causing her suicide. Kimbrough is one tough hombre and rules the town with intimidation. His underlings chase Bart out of the church and into a derelict barn for cover. The remainder of the film is a lengthy siege of Kimbrough’s men against Bart’s pinned down position. During the tense action slowly the details Bart’s wife’s suicide are brought to light revealing a more complex character than the typical western hero. By the end of the film Boetticher’s hero is a broken man and a disgraced hero, whose anger has clouded his rational behaviour. Boetticher also cleverly turns Kimbrough around. Like Richard Boone’s Frank Usher character in “The Tall T” good and evil is a fine and ambiguous line. It’s Kimbrough who changes the most by the end - at the point of his defeat he accepts his comeuppance and challengeS Bart to an honourable duel. Boetticher's notions of good and evil, and justice are defined by the western genre – the raw, primitive and lawless way of life governed by man’s individual code of honour. A man’s word is bond and death as a way of reclaiming one’s honour. “Decision at Sundown” is a great film revered by some of the great filmmakers, including Martin Scorsese, Clint Eastwood, Quentin Tarantino, Sergio Leone, Jean-Luc Godard. In the new Budd Boetticher Box Set from Sony all of these filmmakers (save the dead ones) go on camera to show their respect for this great and underappreciated filmmaker. As I watch each successive film in this unique director/actor collaboration my understanding of cinema continues to be enlightened.